Polyester webbing harnesses are heavy duty, yet lightweight and suited to many varied applications. 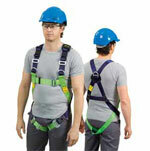 Polyester harnesses are available in a range of configurations to suit many working applications and environments. Bright colours help to increase the visibility of the harness, enabling better visual worker compliance and easier inspection of harnesses. The shoulder and leg straps are a different colour for ease of donning. Manufactured from heavy duty and lightweight polyester webbing, strength is increased without compromising the users comfort. The polyester webbing also offers users excellent UV and strong chemical resistance. Incorporating innovative sewing patterns, polyester harnesses maintain their flexibility long term. 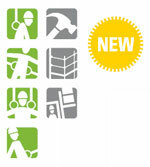 The new self-contained label pack allows important information to be kept legible and safe. 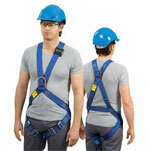 Vest style design, polyester webbing fall arrest harness for working at height and confined space. Frontal fall arrest attachment point, rear and extended dorsal dee. Label pack stores all relevant harness documents. Lanyard ring located on label pack for temporary lanyard parking. 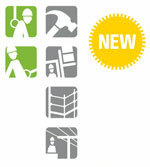 Brightly coloured webbing to increase worker visibility. Confined space loops on shoulder straps. 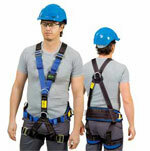 Vest style design, Polyester webbing fall arrest harness for working at height. Lanyard ring on label pack for temporary lanyard parking. 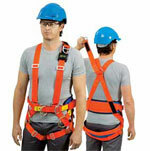 Vest style design, Polyester webbing fall arrest harness for working at height with pole straps and in confined spaces. Confined space loops and work positioning side dees. Back pad offering greater back support and stability. Full body polyester webbing harness with multiple attachment points to suit various applications. 300mm extension of rear fall arrest soft-eye-dee. Frontal fall arrest and confined space loops on shoulder straps. Adjustable shoulder and padded leg straps. Complies with AS/NZS 1891.1 2007. Specifically designed for line and pole top workers, this harness offers many features to suit these applications. Frontal fall arrest dee and extended dorsal dee. Work positioning side dees for work with pole straps. Fully adjustable waist, shoulder, leg and buttock straps. Lumbar and buttock padding offering greater comfort. 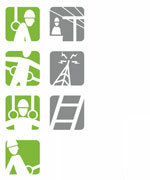 Suited to line workers, pole top workers, tower and ladder work. The ultimate tower harness with multiple attachment points for maximum compatibility for various applications. Frontal fall arrest attachment loops. Lumbar and buttock padding equipped with tool loops. 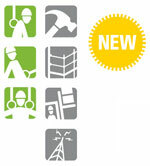 Suited to electrical, ladder and tower work, tree pruning, EWP work, confined space and rescue applications. 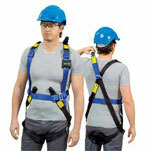 Work positioning harness with padded leg straps for working in suspension, and twin rope access applications. Frontal fall arrest, rear dorsal and work positioning dee rings. Step in harness with padded leg straps and lumbar support. Adjustable leg and shoulder straps. 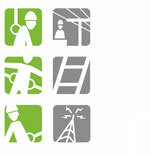 Suited to rescue, ladder work, work positioning, window cleaning, telecom and utility applications. Designed for use in applications where hot sparks or molten materials may come in contact with the harness. Kevlar© and Nomex© webbing provides ultimate heat protection. Kevlar© core adds strength and high temperature resistance. Frontal and rear fall arrest attachment points.